Good day everyone! It is cold and snowing here in the Shenandoah. Maybe one day I will be able to tell you that "it is warm and sunny in the Shenanadoah!" Here's to hoping! No school, AGAIN. However, I have been rather productive getting ahead in this weeks assignments and.....drumroll please........I pulled threads and fabric for my very first ornament. Now, don't think that I did this on my own. My dear friend Robin has been the driving force behind this new project. 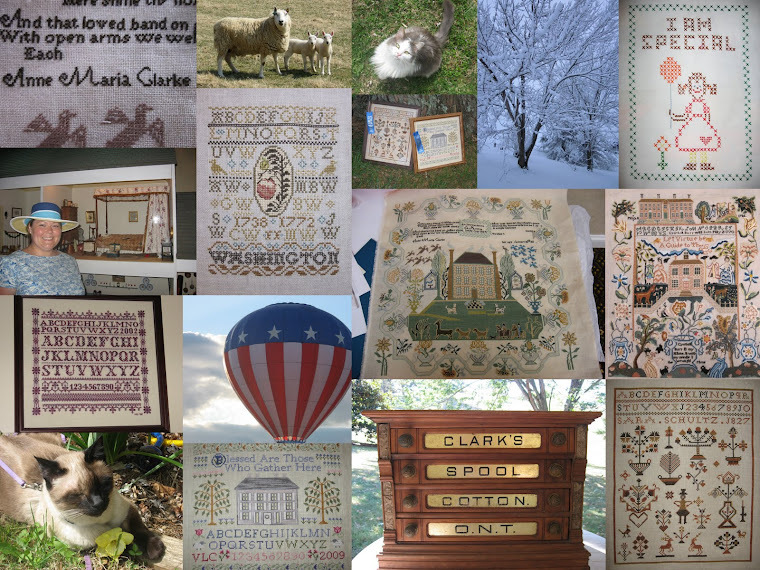 That is what I am loving about Blogland...you find the most amazing stitching friends! I already had the pattern, JBW designs, "A Very Merry Christmas," so I dug throug some stash and found threads that I *think* will work. I plan to start stitching this tomorrow. I want to put a few more stitches in Beatrix Potter before I put her down again. Thank you to all of the wonderful new people that I have met through this blog. You all have inspired me more than you know! Connie, I am glad to have found another PA Dutch sampler lover! I am not a Pennsylvanian but I feel related to the PA Dutch. My ancestors lived in the heart of PA Dutch country centuries ago. There was little land left, so the headed south to the Shenandoah Valley in VA. So, I feel connected and like to think that one of my ancestors probably stitched some type of motif sampler. Karen, I am glad that you like the 23rd Psalm sampler. It is gorgeous! I have found another VeraK that I want to stitch, "How Great Thou Art." That is a much beloved hymn in my family...it means quite a lot and it will be next...just have to find it first! Maybe we could start a little VeraK SAL! Margaret from Days of a Sampler Lover has inspired me to start stitching in hand. I only have the hang of about 1/4 of it! I've been looking and looking all over the net for tutorials and all that I found was a short video on YouTube showing someone stitching in hand, no tutorial. Does anybody have any recommendations? I am dying to figure this out! The 1/4 that I have figured out, no doubt is much faster than the poke and pull method. If you know of any books or videos, please let me know! Just write me at valiehokie@gmail.com Oh, and if you just want to email for the heck of it, I would love that too! Well all...I am off to stitch a little before hubby gets home. It is his birthday and he asked to go to the gym on his birthday. He wants me to go with him. That's love ladies and gentlemen...going with your spouse to the gym because it's his birthday. Guess it won't hurt. I think I am starting to get 'stitchers hips!" Till next time...Happy Stitching! I think you picked out a great pattern for your first ornament! I wish that I could give you good instructions on stitching in hand, but I haven't done it in years. I use scroll rods now. But once you get the in hand stitching mastered, you will fly through pieces. That's a great ornament to start out with. I have one from JBW as well that I need to stitch , just haven't found the right fabrci I want to use yet. I stitch in hand all the time. You'll get the hang of it.Just keeip on truckin'! Thanks for all of the comments that you leave on my blog. They're always so sweet! Love your first ornament project and looking forward to seeing either the post of it in progress or the post of it finished! Stitchers around the internet are a wonderful bunch! And it is always nice to 'meet' a fellow stitcher in your state! Have fun at the gym and pass along my birthday wishes to your husband! What a nice ornament to stitch! I stitch in hand, just find it more comfortable. I don't know that I can give you any hints about it, you just pick up the fabric and stitch. Hope you'd a good time at the gym! That looks like a great choice for an ornament! For stitching in hand, it just takes practice till it feels normal/natural. Just stick with it & within a week or two, you'll wonder how you managed to hang onto a frame/qsnap/hoop and stitch at the same time! What a beautiful blog you have. I found it today, and your stitching is beautiful. Now you are starting an ornament you will soon be hooked on them! I hope you enjoy the design you have chosen, it's a wee cutie.